Photo Courtesy Lone Creek Cattle Co.
Calves raised for Lone Creek Cattle Company in Lincoln, Neb., are at least half Piedmontese, giving them a unique double-muscled quality. 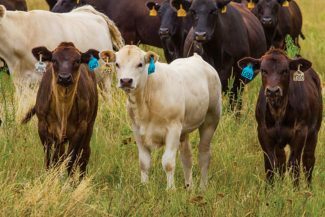 While many in the cattle business focus on producing the kind of cattle they like, one Nebraska operation is focusing on what the customer likes. Lone Creek Cattle Company is based in Lincoln, Neb., with ranches situated in the western part of the state. The unique breed they are marketing is the double-muscled Piedmontese. "Piedmontese are the only beef breed that naturally produces tender lean beef," Thad Robertson said. "It's the opposite way of how most of us grew up thinking." In Piedmontese cattle, the myostatin allele is naturally mutated, giving the breed a double muscled quality. According to Robertson, who manages compliance and traceability for Lone Creek, the breed isn't much different from traditional breeds like Angus and Hereford. They eat the same and depend on the same needs to gain weight, but the muscle they gain is structured differently. The mutated gene happened naturally, but is a key quality to what sets Piedmontese cattle apart. The myostatin gene reduces the fiber frequency in muscle, and creates muscle mass in traditional cattle breeds. In Piedmontese cattle, the myostatin gene is inactive, producing double-muscled beef that is rich in protein and nutrients. This also means the Piedmontese breed produces very little fat. "Research shows that as long as the animal has the C313Y inactive myostatin mutation, it is going to have lean and tender traits," Robertson said, "And I need to stress the fact that this breed has not been manipulated in any way to get the inactive myostatin gene." The market for this breed is relatively small. Robertson said he doesn't know of another breeder in the Midwest that compares to the scale Lone Creek is operating at. There are two sides to the business. The live side operates under Lone Creek Cattle Company, breeding full blood bulls for lease. 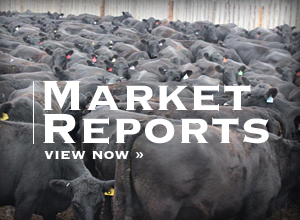 Producers can lease bulls in a program that has a calf crop buyback program. Lone Creek promises to buy back all of the calves, provided producers follow the vaccination and weaning guidelines set by the company as a Verified Natural Beef program. They aim for a 625-pound weaning weight, but guarantee a $180 a head premium on top of the state weekly average the week prior to purchase for all calves that made it through the program as specified. Allen and Zenda Haase have been raising cattle for Lone Creek at their Valentine, Neb., ranch for nearly six years. For them, the program is effective and takes the stress out of selling at the auction barn. "These guys come, they load them up, weigh them and then we get paid for the average," Allen said. Haase appreciates that Lone Creek will buy back the calves all at once rather than split groups for slight size variations or imperfections like you would find at a sale barn. He said the conveniences offered by Lone Creek, like trucking and flexibility, take the stress out of selling their calves, which are out of their own Angus cows and Lone Creek Piedmontese bulls. Though the bulls' appearance gives a different idea, Allen and Zenda say they haven't posed any more calving problems than their Angus bulls did, although they don't cross the Piedmontese bulls on their heifers. Calves are age- and source-verified, giving consumers peace of mind if meat ever needs to be traced back to where the cattle were raised. This is important for the boxed beef side of the business. Certified Piedmontese is the raw meat side of the business. Direct marketing, online ordering, domestic business-to-business, and a small export business to Europe and Hong Kong is what drives the business. According to Robertson, most of their online customers are the top-tier beef-eaters and health-conscious consumers. Their online prices reflect that top-of-the line market, with a gift box of steaks, including tomahawk ribeyes and New York strip steaks selling for about $23.65 a pound. Their Dynasty selection offers purebred Piedmontese beef steaks for about $30 a pound. They have also created hot dog, hamburger and beef jerky lines to create a broader audience. More than 12 portioned cuts by Certified Piedmontese and Great Plains Beef are certified by the American Heart Association as extra lean. To view these cuts, visit http://www.piedmontese.com. 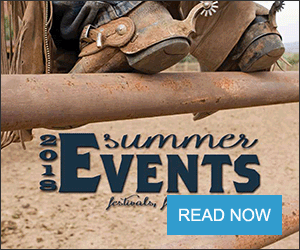 Kala Holmes, Great Plains Beef process coordinator said, "It's the best of both worlds. You're going to get a steak that's lower in total fat, saturated fat and calories without sacrificing flavor or tenderness." Lone Creek Cattle Company and Certified Piedmontese collectively believe education is key in their market. The company believes they truly have a unique product, and it is new to most consumers. "Those who take the time to understand the difference between our product and that of a traditional beef company are so impressed with the leanness of the product while being tender and full of flavor all at the same time," Holmes said. At Lone Creek and Certified Piedmontese, consumers will have the peace of mind knowing where their steak comes from. "We have full farm to fork traceability and never subject the cattle to growth hormones, steroids, antibiotics or animal by-products," Holmes said. Robertson calls this an "exciting time in the beef industry" and says one of the many reasons he enjoys working for Lone Creek Cattle Company is their progressive mindset. The owners dedicate a lot back to the industry," he said. He believes educating the consumer is a big part of why this niche works for them. While many consumers might think it's too good to be true, Robertson suggests just giving it a try and letting the meat speak for itself and Holmes agreed.